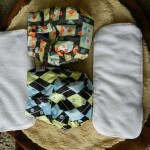 Last year I was given the opportunity to review a pocket diaper by Glow Bug Cloth Diapers. Before reading THIS review, I recommend you read the original review. There, I go into more detail about Glow Bug itself and their diapers. 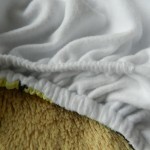 The mild complaint I had with Glow Bug cloth diapers in 2012 was that their SlimDry fabric (the fabric against baby’s skin) pilled after the second wash and stained very easily. I also noted their inserts were narrower than most inserts on the market. After my review, I was contacted by one of the owners and creators of Glow Bug, Neta. She informed me the new collection (just released) would have a new version of the SlimDry fabric that should stain and pill less. I was able to purchase two of the new Glow Bug diapers through a co-op. 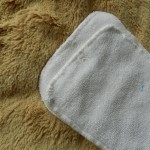 All the issues I had with the old diapers…gone! 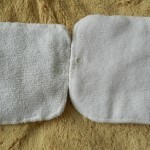 Not only that, but both included inserts have a snap, so you can snap them together to double stuff the diaper! I now give these diapers 5 out of 5 stars, because they’re packed full of awesome features for an awesome price! You can purchase 6 diapers for $70-75 dollars or 12 for $150 (Canadian currency). Don’t want to purchase that many? Glow Bug is very open to working with co-ops. Message me for more info. Want to try out the new Glow Bug diapers? You can purchase them through the links/shopping cart below!